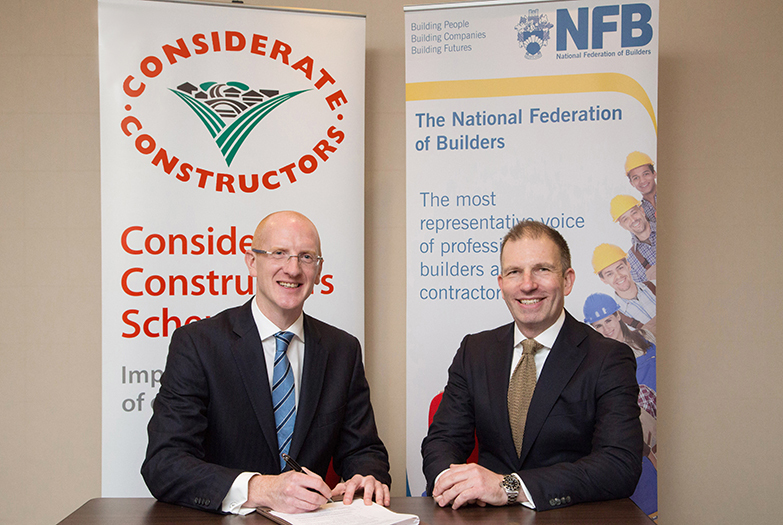 The Considerate Constructors Scheme and the National Federation of Builders (NFB) – the construction industry’s longest established trade association – have formed a partnership to promote best practice and raise standards across construction industry SMEs. This first, truly ground-breaking collaboration between two construction industry organisations heralds a new way in which like-minded organisations can work effectively together to offer greater benefits to members, at no additional cost. The partnership will provide NFB members, with a turnover banding of £500,000 to £3.5 million, free Company Registration with the Scheme. It will come in to effect from 1 January 2017. By becoming a registered company, NFB members (in this banding) will have the opportunity to demonstrate their commitment to improving the image of the industry. Scheme-registered companies voluntarily agree to abide by its Code of Considerate Practice. The Code commits those registered with the Scheme to care about appearance, respect the community, protect the environment, secure everyone’s safety and value their workforce. SMEs are a critical part of the construction industry’s future success. They have a huge role and responsibility to continually raise their standards and, in doing so, make a valued contribution to improving the image of the industry. The NFB provides a great platform for the Considerate Constructors Scheme to help support SMEs in championing the principles of considerate construction. We are therefore delighted to establish this partnership with the NFB. We’re delighted to join forces with the Considerate Constructors Scheme to offer added value to our members. NFB members pride themselves on their professionalism and ability to deliver exceptional quality, so it’s great that their efforts can now be recognised as part of the Scheme. SMEs often miss out on opportunities simply because they don’t have the resources to complete the multitude of registrations and benchmarking initiatives available in the industry. By collaborating in this way, we hope to reduce this burden and improve access to opportunities, working towards achieving a fair playing field for SMEs in construction. A record number of over 900 Company Registrations have been made with the Scheme so far this year, with a total of more than 4100 Company Registrations taking place since this type of registration was introduced by the Scheme in 2009. A number of exciting changes are coming to Company Registration in 2017. Please click here for more information.